KIPUSHI, DEMOCRATIC REPUBLIC OF CONGO – Robert Friedland, Executive Chairman of Ivanhoe Mines (TSX: IVN; OTCQX: IVPAF), and Lars-Eric Johansson, Chief Executive Officer, announced today that an independently prepared estimate has resulted in a significant increase in Measured and Indicated Mineral Resources at the company’s high-grade, Kipushi zinc-copper-silver-germanium mine. The new Mineral Resource estimate is the first update to be issued for Kipushi since Ivanhoe Mines published its initial, independent NI 43-101 estimate in January 2016. The new Mineral Resource estimate has increased Kipushi’s Measured and Indicated zinc-rich resourcesby 16%, from 10.2 million tonnes to 11.8 million tonnes, with an increase in zinc grade from 34.89% to 35.34%. In addition, the mine’s Measured and Indicated copper-rich resources have increased by 40% from 1.6 million tonnes to 2.3 million tonnes, with a slight increase in the copper grade from 4.01% to 4.03%. Measured and Indicated Mineral Resources, primarily in the Big Zinc Zone, have increased to 11.78 million tonnes at grades of 35.34% zinc, 0.80% copper, 23 grams per tonne (g/t) silver and 64 g/t germanium, at a 7% zinc cut-off – containing an estimated 9.2 billion pounds of zinc. 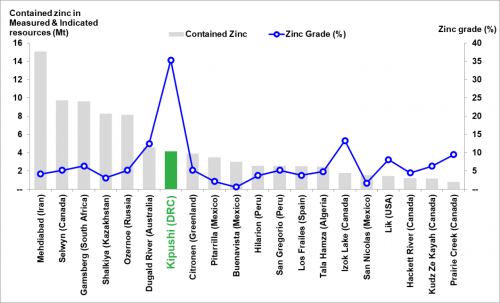 The zinc grade of Kipushi’s Measured and Indicated Mineral Resources is more than twice as high as the world’s next-highest-grade zinc project, independently ranked by Wood Mackenzie, an international industry research and consulting group, based on contained zinc (Figure 1). Zinc-rich Inferred Mineral Resources total an additional 1.14 million tonnes at grades of 33.77% zinc, 1.24% copper, 12 g/t silver and 62 g/t germanium. The Inferred Mineral Resources are contained partly in the Big Zinc Zone and partly in the Southern Zinc Zone. 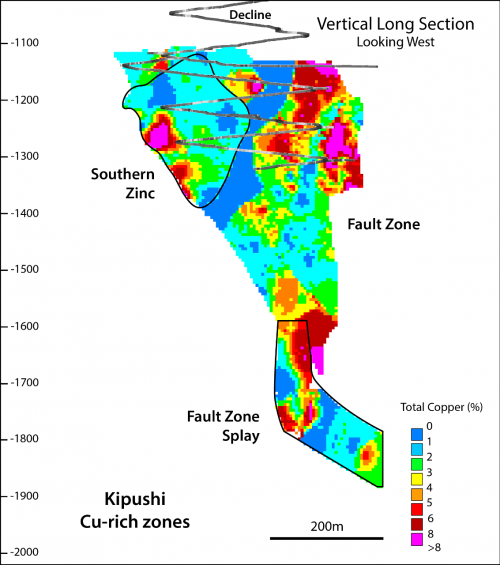 Kipushi’s copper-rich Measured and Indicated Mineral Resources contained in the adjacent Fault Zone, Fault Zone Splay and Série Récurrente Zone total an additional 2.29 million tonnes at grades of 4.03% copper, 2.85% zinc, 21 g/t silver and 19 g/t germanium, at a 1.5% copper cut-off – containing 144 million pounds of copper. Copper-rich Inferred Mineral Resources in these zones total an additional 0.44 million tonnes at grades of 3.89% copper, 10.77% zinc, 19 g/t silver and 55 g/t germanium. 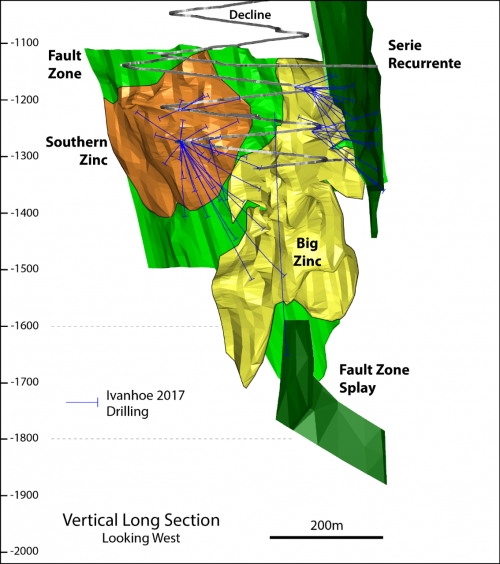 Ivanhoe’s 2017 drilling program has demonstrated that zinc and copper mineralization of the Kipushi system remain open laterally and at depth. The new Mineral Resource estimate incorporates Ivanhoe’s second phase of underground drilling at Kipushi that was completed late last year, with a total of 9,706 metres drilled in 58 holes. Eight holes were drilled for metallurgy, 31 holes in the Southern Zinc and Big Zinc, five holes in the Nord Riche and 14 holes in the Série Récurrente. The updated Mineral Resource will be used in the preparation of the Kipushi Definitive Feasibility Study (DFS), which is expected to be finalized later this year or early in 2019. The DFS will update and refine the findings of the Preliminary Feasibility Study (PFS) issued last December. 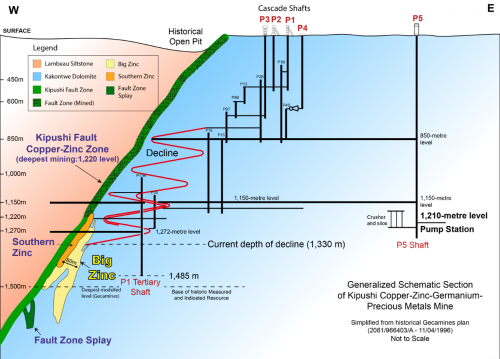 Similar to the PFS, the DFS will focus on the initial mining of Kipushi’s Big Zinc Zone. The planned return to production would establish Kipushi as the world’s highest-grade, major zinc mine. Infill and confirmation drilling in the Southern Zinc Zone has confirmed the high tenor of this mineralized zone (tenor is the percentage of minerals that is actual metal to be extracted), which is characterized by high zinc, copper, lead and silver grades. The poly-metallic style of mineralization in the Southern Zinc is very similar to historical Kipushi production, with a clear zonation of copper-rich to zinc-rich zones. Using a zinc cut-off of 7%, the Southern Zinc Zone contains 0.88 million tonnes of Indicated Mineral resources at a grade of 24.5% zinc, 2.97% copper, 1.95% lead and 75 g/t silver. Additional Inferred Mineral resources in this zone are 0.16 million tonnes at a grade of 24.37% zinc, 1.64% copper, 1.2% lead and 38 g/t silver. Mr. Friedland said that the new resource estimate is very positive for mine planning purposes, adding another 1.6 million tonnes of Measured and Indicated zinc-rich resources and, at the same time, improving the overall zinc grade of the resources. “We have always believed that Kipushi held the potential to host significantly more high-grade zinc, copper, silver and germanium resources than were initially reported in the mineral inventory when we acquired our 68% interest in the mine in 2011,” Mr. Friedland said. “Kipushi operated for more than 60 years as a high-grade copper mine, with significant germanium production, before it was placed on care-and-maintenance in the 1990s. With continued exploration success, we are confident Kipushi could remain in production for at least several more decades. 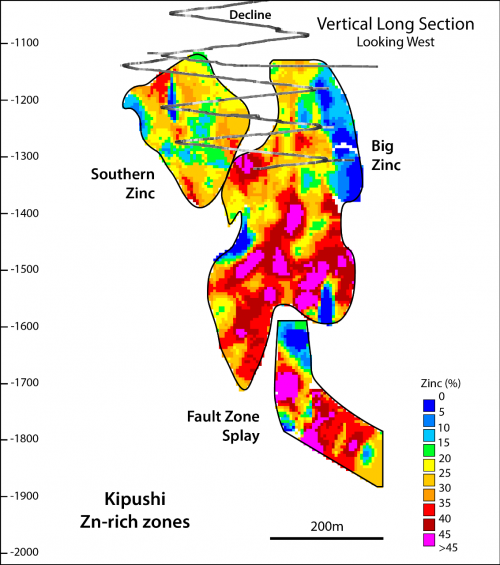 “While our initial mine plan focuses on mining Kipushi’s exceptionally high-grade Big Zinc Deposit, the adjacent Fault Splay and Southern Zinc zones are compelling, near-term development targets as they have thick, zinc-rich mineralization zones grading up to 45% zinc. In addition, the copper-rich zones offer further opportunities to expand and diversify the mine plan once production recommences,” Mr. Friedland added. Given the significant, very-high-grade zinc resource at Kipushi – which is rich in potential by-product credits including copper, silver and germanium – and the ongoing exploration campaign at Kipushi, Ivanhoe and the Gécamines technical team are continuing to investigate additional downstream processing options. Germanium is a strategic metal that is a key component of fibre-optic systems, infrared optics, high-efficiency solar cell applications and light-emitting diodes. The current spot price of germanium is approximately US$1,900 a kilogram (US$54 an ounce). The new Mineral Resource estimate was prepared in accordance with the 2014 CIM definition standards, incorporated by reference into Canadian National Instrument 43-101 – Standards of Disclosure for Mineral Projects. The new estimate was based on the results of the 58 new drill holes completed at Kipushi by Ivanhoe Mines in 2017, 84 drill holes completed by Ivanhoe Mines prior to 2016 and an additional 107 historical holes drilled by Gécamines. Mineral Resource estimates were completed below the 1,150-metre-level on the Big Zinc Zone, Southern Zinc Zone, Fault Zone, Fault Zone Splay and Série Récurrente Zone. The Mineral Resources were categorized either as zinc-rich resources or copper-rich resources, depending on the most abundant metal. The Big Zinc and Southern Zinc zones have been tabulated using zinc cut-offs and are shown in Table 1; the Fault Zone, the Fault Zone Splay and Série Récurrente Zone have been tabulated using copper cut-offs and are shown in Table 2. The Kipushi Mine is adjacent to the town of Kipushi, approximately 30 kilometres southwest of Lubumbashi and less than one kilometre from the Zambian border. The Kipushi Mine is operated by Kipushi Corporation (KICO), a joint venture between Ivanhoe Mines (68%) and Gécamines (32%), the DRC’s state-owned mining company. In December 2017, KICO signed a memorandum of understanding (MOU) with Byrnecut Offshore Proprietary Limited (Byrnecut), of Perth, Australia. The MOU relates to the potential engagement of Byrnecut to provide underground mining services at Kipushi, including cost estimation, contractor management, operational readiness and operational services. Figure 1. World’s top 20 zinc projects, by contained zinc. Figure 2. Generalized schematic section of Kipushi Mine. The Fault Zone (green), Big Zinc Zone (yellow), Southern Zinc Zone (brown) and Fault Zone Splay (dark green) are shown in the bottom left corner of the section. Access to these zones will be via the decline (shown in red) leading from the mine’s 1,150-metre level. The ore will be transported up the decline and along the 1,150-metre level to the P5 Shaft, where it will be crushed and hoisted to surface for processing. Figure 3. Vertical long section (looking west) showing Kipushi’s Big Zinc, Série Récurrente, Southern Zinc and Fault zones, and the Fault Zone Splay. Traces of the 58 holes drilled by Ivanhoe in 2017 are shown in blue. Figure 4. Vertical long section (looking west) showing Kipushi’s zinc-rich mineralized zones, with grades ranging up to more than 45% zinc (pink). Figure 5. Vertical long section (looking west) showing Kipushi’s copper-rich mineralized zones, with grades ranging up to more than 8% copper (pink). The Mineral Resource estimate has been completed by Mr. J.C. Witley (BSc Hons, MSc (Eng.)) who is a geologist with 30 years’ experience in base and precious metals exploration and mining as well as Mineral Resource evaluation and reporting. He is a Principal Resource Consultant for The MSA Group (an independent consulting company), is a member in good standing with the South African Council for Natural Scientific Professions (SACNASP) and is a Fellow of the Geological Society of South Africa (GSSA). Mr. Witley has the appropriate relevant qualifications and experience to be considered a “Qualified Person” for the style and type of mineralization and activity being undertaken as defined in National Instrument 43-101 Standards of Disclosure of Mineral Projects. Ivanhoe Mines maintains a comprehensive chain of custody and QA-QC program on assays from its Kipushi Project. Half-sawn core was processed either at its preparation laboratory in Kamoa, DRC, or its exploration preparation laboratory in Kolwezi, DRC. Prepared samples then are shipped to Bureau Veritas Minerals (BVM) Laboratories in Australia for external assay. Industry-standard certified reference materials and blanks are inserted into the sample stream prior to dispatch to BVM. Ivanhoe Mines’ QA-QC program has been set up in consultation with MSA Group (Pty.) Ltd., of Johannesburg. Such statements include without limitation statements that the updated Mineral Resource will be used in the preparation of the Kipushi Definitive Feasibility Study, which is expected to be finalized later this year or early in 2019, and statements regarding mine planning and operations. This news release also contains references to estimates of Mineral Resources. The estimation of Mineral Resources is inherently uncertain and involves subjective judgments about many relevant factors. Mineral Resources that are not Mineral Reserves do not have demonstrated economic viability. The accuracy of any such estimates is a function of the quantity and quality of available data, and of the assumptions made and judgments used in engineering and geological interpretation, which may prove to be unreliable and depend, to a certain extent, upon the analysis of drilling results and statistical inferences that may ultimately prove to be inaccurate. Mineral Resource estimates may have to be re-estimated based on, among other things: (i) fluctuations in zinc, copper, germanium, silver or other mineral prices; (ii) results of drilling; (iii) results of metallurgical testing and other studies; (iv) changes to proposed mining operations, including dilution; (v) the evaluation of mine plans subsequent to the date of any estimates; and (vi) the possible failure to receive required permits, approvals and licences.